Take a trip back to an era when steam-driven locomotives were an essential part of every day life. Trips to Cass Scenic Railroad State Park are filled with rich history, unparalleled views and the sights and sounds of an original lumbering town. The park’s 11-mile long heritage railroad and authentic company town are some of the state’s most popular tourist attractions. The Company Store, open daily from 8 a.m. to 8 p.m., is a popular destination and houses The Last Run Restaurant, gift shop and museum. Stop by the visitors center for more information. Open daily from 9 a.m. to 5 p.m. Cass Scenic Railroad State Park also is one of America’s only authentic operating museums of lumber railroading. Take in the view and get some exercise while you’re at it! While the park doesn’t have its own hiking and biking trails, a portion of the Greenbrier River Trail can be easily accessed from the park. Row (or paddle) your way across Watoga State Park’s 11-acre lake! Rentals are available. Fishing in the waters around Cass is one of the park’s most popular activities. The area of Spruce and the Shaver’s Fork of the Cheat River are known as some of the premier fishing areas in the state. Come see what you can catch! Are you up for an adventure? Take your chances at geocaching and work as a team to find the single hidden cache site at Cass Scenic Railroad State Park. All you need is spirit for adventure and a smartphone with GPS! Maintain your game at the nearby Snowshoe Mountain Resort. Designed by Gary Player, the 18-hole course is one of West Virginia’s best greens. Take in the view and get some exercise while you’re at it! Walking tours of the Historic Town of Cass are led Tuesday through Sunday at noon and 4 p.m. If you’re looking to hike or bike a trail, a portion of the Greenbrier River Trail can be easily accessed from the park. The vast Monongahela National Forest has numerous hunting opportunities. Typical big and small game include deer, bear, turkey, grouse, and woodcock. Hunting licenses are available online. Discover more about trains at the Cass Historical Museum, open Tuesday through Sunday, 9:30 a.m. to 5:30 p.m. Exhibits are free. While you’re there, take a guided tour of the locomotive shop. See how engineers repair and maintain the historic Shay locomotives! After stopping by the museum, take a stroll through the historic logging town of Cass during one of our guided walking tours, scheduled at noon and 4 p.m., Tuesday through Sunday. Cool down at the Cass Historic Theater and watch a documentary about the history of Cass and Cass Scenic Railroad. Showtimes are 10 a.m., 11 a.m., 1 p.m. and 5 p.m. Tuesday through Sunday. You also can delve into military history at nearby Droop Mountain Battlefield State Park. The Civil War site has a museum, lookout tower, scenic hiking trails, and occasional reenactments. The historic logging town of Cass never fails to spark the imagination. Wander solo or visit the park headquarters for tour times. You can also visit nearby Watoga State Park, which has a playground, game courts, and a recreation building. Seneca State Forest in Dunmore has volleyball courts, horseshoe pits, and a playground. Don’t be the last one on the caboose! Catch a ride on Cass Scenic Railroad State Park’s main attraction, the 4.5-hour train ride to the overlook at Bald Knob. Bald Knob is the third highest point in West Virginia, making for a breathtaking views and amazing photos. In addition to other train excursions, the park offers a series of dinner train rides throughout the summer and a variety of special train rides and packages during the year. 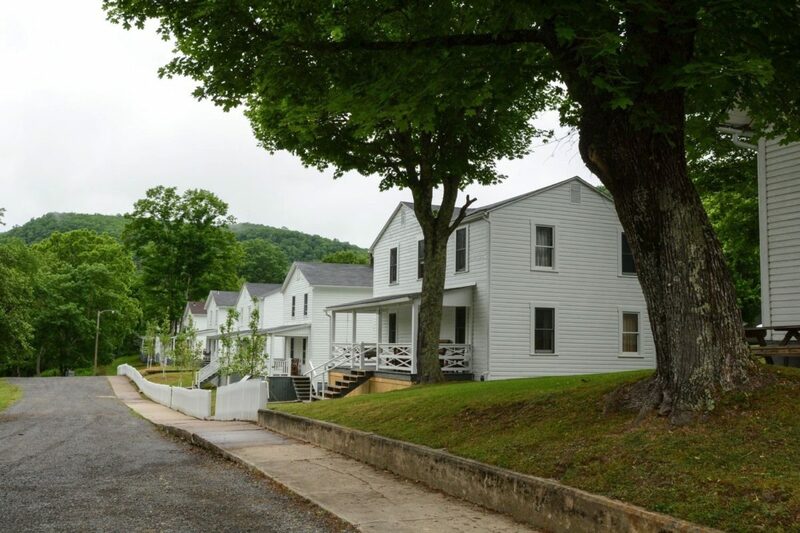 The town of Cass remains relatively unchanged since its founding in 1901 by the West Virginia Pulp and Paper Company. Cass was built as a company town for the loggers who worked in the nearby mountains. Construction of the railroad started in 1901. It was used to haul lumber to the mill at Cass. The railroad track was eventually extended to the top of Bald Knob, the third highest mountain peak in West Virginia. In June 1942, the Cass operation was sold to Mower Lumber Company, which operated the town until July 1960, when the mill and railroad were shut down due to rapid decline of the timber industry in the region. In 1961, Cass was brought into the state parks system. In 1977, the company town also was made part of the parks system. Over the years, the railroad was turned into a tourist line and the town was repaired and restored. Today, the railroad is still in full operation, but is managed by the Durbin and Greenbrier Railroad. Catch a ride on Cass Scenic Railroad State Park’s main attraction, the 4.5-hour train ride to the overlook at Bald Knob. Bald Knob is the third highest point in West Virginia, making for a breathtaking views and amazing photos. In addition to other train excursions, the park offers a series of dinner train rides throughout the summer and a variety of special train rides and packages during the year. Go back in time and stay in one of Cass’ historic, two-story company houses. The 20 company houses have been refurbished and can sleep anywhere from four to 14 people. They feature bathrooms and fully-equipped kitchens, television and WiFi, cooking utensils, tableware, towels, dishcloths and linens. Houses are heated for winter rentals and two houses are disability accessible. You deserve to travel in style! Enjoy a train ride to Bald Knob in an authentic caboose. Cass Scenic Railroad offers cabooses for overnight stays or multiple nights with private accommodations for up to 5 people. All rentals are by reservation only during normal operating season. Each caboose is equipped with a coal heating stove and sink. Drinking water is provided for guests. Get off the grid and explore the remote backcountry of Cheat Mountain on this unique excursion! The Last Run Restaurant, operated by the Bodkin Sisters, features home cooking, (they’ll even pack lunches for trips up the mountain!). Sandwiches, daily specials and beverages are available at reasonable rates. Open 8 a.m. to 8 p.m. For more information about meal and dining specials, check out the Last Run Restaurant Facebook page. During the winter, hours are Wednesday through Saturday from 8 a.m. to 8:00 p.m. and Sunday from 8 a.m. until 6 p.m. On Monday and Tuesday, the Soda Fountain is open from 8 a.m. until 6 p.m. with a hot menu. The Last Run Restaurant was featured in the “101 Unique Places to Dine” (in West Virginia) in 2009. The Last Run Restaurant also received this honor in 2015! It’s a step back in time with good food and great people preparing it for you. If you’ve not taken time to eat at the Last Run Restaurant, you’re missing an item on your bucket list! Cass has a restaurant and museum, plus shopping at the Company Store and the shops at Leatherbark Ford, featuring handcrafted items and artistry including paintings, needlework, quilts, blacksmithing, baskets, soaps. Guided tours of the Town of Cass are available, and the park features an intricate diorama of the town when it was a logging community. While Cass Scenic Railroad State Park does not have any trails of its own, the Greenbrier River Trail is close by. This 78-mile-long rail trail (operated by the West Virginia state park system) is popular with hikers, bikers and horseback riders. Just an hour south of Cass, Beartown State Park’s natural area expands 107 acres across the eastern summit of Droop Mountain. Who else can say they toured the largest area of bogs in West Virginia? The U.S. Forest Service conducts spectacular guided tours during the summer months here. Experience history like never before at Droop Mountain Battlefield State Park. This is the site of the famous Civil War battle. Visit in October and you can catch a re-enactment! Enjoy nature like never before! Experience a 78-mile- long rail trail operated by the West Virginia State Park system that is a hit with hikers, bikers and horseback riders. Don’t stick to the same old roads! Take a detour on the National Scenic Byway, a beautiful 43-mile corridor through the Monongahela National Forest. Cool off a bit or simply take in the natural beauty! Just off of the Highland Scenic Highway, this popular 114-acre area contains three waterfalls. At 3,930 feet above sea level, this is the state’s highest forest. It features fully equipped pioneer cabins, campsites, bathhouse, picnic areas and an abundance of wildlife. Reach for the stars at Green Bank Observatory! Public tours are available at this advance research facility. Check out the gift shop for cool souvenirs or grab a bite to eat at Starlight Cafe. Enjoy West Virginia’s oldest state forests! With pioneer guest cabins, lake fishing, camping and hiking it has fun waiting for every guest. What could be better than skiing in the winter? Come ski at Snowshoe, a four-season resort that’s especially popular during the winter season. Hike Whispering Spruce Trail and climb the tower for beautiful vistas and observe how vegetation has adapted to this high-elevation environment. Watoga State Park offers 10,100 acres of endless beauty just for you. The park is filled with recreational activities including hiking, swimming fishing and boating and vacation cabins that are open year-round. Unwind at this luxurious fishing getaway, where trout are plentiful. Get help from professional guides or load up at the fly shop— the largest in West Virginia. Stylish lodging and cabins make your mountain stay complete.